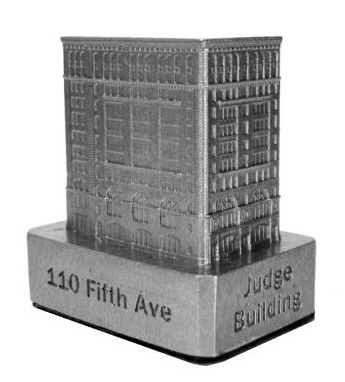 The Judge Building is located at 110 Fifth Avenue in Manhattan, NY and was completed in 1888. The building was designed by McKim, Mead & White and stands 147 feet tall with 11 floors. Our replica features the original facade located on the back of the model. This pewter replica stands just less than 1-1/2 inches tall and is finished in new pewter. This model's scale is 1 inch = 150 feet.